Boxing great Oscar De la Hoya is keen to buy into the LA Clippers after the basketball team's owner was banned for life after making racist remarks. NBA commissioner Adam Silver has urged the board of governors to force Donald Sterling, who was also fined £1.5m, to sell his interest in the team. 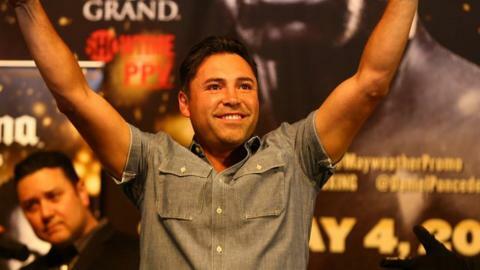 Former six-weight world champion De la Hoya said: "I hope to be a part of positive change for the league." Fellow boxer Floyd Mayweather Jr is also considering getting involved. "When it comes to business, what better than two minorities? The commissioner wanted to see more minority ownership in the NBA," De la Hoya told USA Today. "If he wants more minorities involved in the NBA, what better than me and Floyd to be part of a potential ownership group?" If successful, De la Hoya and Mayweather, who has won all of his 45 fights, will follow Magic Johnson and Michael Jordan as athletes turned professional sports team owners. It would also follow former England football captain David Beckham's plans for a new Miami-based Major League Soccer franchise. Sterling, 80, was recorded asking a woman not to associate in public with black people nor bring them to games. He later said the recording "does not reflect his views" but has not since commented on the sanctions. The remarks caused an immediate uproar among basketball fans across the country, and drew condemnation from US President Barack Obama. Silver, who is less than three months into the job as NBA commissioner, said that Sterling's "hateful opinions... simply have not place in the NBA". There was support from the world of sport for the ban and fine - which was the maximum allowed - in what has been described as the harshest punishment in the history of the NBA. De la Hoya added: "I applaud NBA commissioner Adam Silver for his quick and decisive action regarding in the Donald Sterling situation, and his forward thinking will push the league toward a positive future. The business magnate, 80, bought the Clippers in 1981 and has been the longest-tenured owner in the NBA since LA Lakers majority owner Jerry Buss died in 2013. His net worth is estimated to be £1.1bn, according to Forbes. "There is no room for racism and unfair treatment in any professional sport, or in life in general." Miami Heat's LeBron James added: "Commissioner Silver thank you for protecting our beautiful and powerful league!! Great leader!" NBA legend Magic Johnson added: "Current and former NBA players now know that in Commissioner Adam Silver we have a great leader leading our league." Clippers team coach Doc Rivers said the ban and fine was the "start of the healing process". Some sponsors had stopped their association with the team as the race row deepened, but following the ban, one electronics company said it would resume advertising. The Clippers secured a 113-103 victory over the Golden State Warriors on Monday to take a 3-2 lead in their first-round play-off series. The players were cheered when they took the court for warm-ups. Two days previously, they had staged a silent protest, going through a pre-match warm-up with shirts on inside-out to hide the team's logo. After the game, Warriors player David Lee said the team had been prepared to boycott Tuesday's game had the NBA not sufficiently punished Sterling. The ban means Sterling, who bought the team 33 years ago, will be unable to participate in team business or attend NBA practices or games. However, 75% of the team owners, who make up the board of governors, must be in favour of Sterling being forced to sell the team for it to happen. Silver said: "I fully expect to get the support I need from the other NBA owners to remove him." A swift punishment, but is it a just one? Read more on A swift punishment, but is it a just one?